China's Race to Space Results in Tragedy ... Perhaps Cause for a Pause? China's race to space has resulted in a tragedy today, June 27. Up until today China's frequent satellite launches have been celebrated. "18 for 18 ... in 2018 China has succeeded with all 18 of its launches so far in 2018, with CASC aiming to launch around 36 times this year, with commercial launches potentially taking that number to 40." "The Long March 2C lifted off from Xichang in Sichuan Province at 11:30 local time (03:30 UTC) carrying a pair of technology test satellites, which successfully entered their intended orbits. However the first stage, which separated from the rest of the space vehicle after performing its burn and shutting down, fell to Earth in Niuchang town, part of Fuquan city in Guizhou, according to a video posted on the Chinese social media platform Sina Weibo." "The spent first stage of a rocket fell on a town in Guizhou Province on Wednesday, shortly after launch of a pair of Chinese satellites from the Xichang Satellite Launch Centre. The Long March 2C lifted off from Xichang in Sichuan Province at 11:30 local time (03:30 UTC) carrying a pair of technology test satellites, which successfully entered their intended orbits. However the first stage, which separated from the rest of the space vehicle after performing its burn and shutting down, fell to Earth in Niuchang town, part of Fuquan city in Guizhou, according to a video posted on the Chinese social media platform Sina Weibo. The remaining hypergolic propellant mix of unsymmetrical dimethylhydrazine fuel and dinitrogen tetroxide oxidiser, both highly toxic, ignited on impact with the ground. No news reports have emerged following the incident. 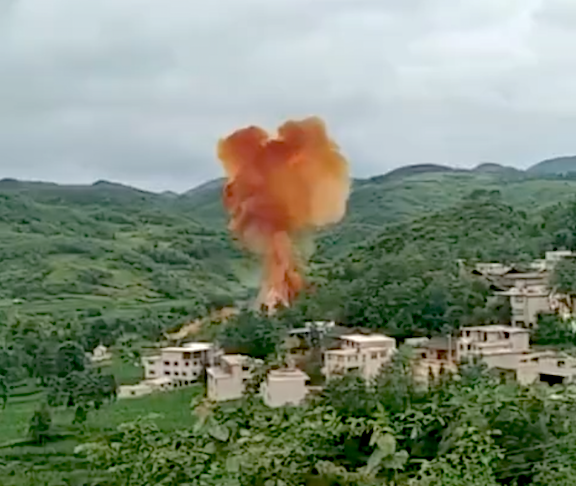 The Chinese military routinely issues notices and evacuates areas calculated to be within the area that used boosters and stages are expected to fall after launch, meaning there may be no casualties. The poster later confirmed that she had received notification of the launch. Boosters from Long March 3B rockets launched from Xichang land near settlements in January and May this year. Today's incident saw the 3.35 m diameter, 25 m long CZ-2C first stage fall among houses. This year, China is aiming to carry out around 40 launches, including 17 from Xichang, which will threaten yet more such incidents. To prevent injuries and deaths, China releases notices and in some instances evacuates areas within the carefully calculated drop zones ahead of launch. However, footage of falling and recently landed rocket stages taken by locals suggests that some ignore orders and also approach the highly toxic wreckage. China's first three launch sites were established during the times of deep security concern during the Cold War, with tensions with the Soviet Union spilling over into border skirmishes and the United States considering preemptive strikes against China on sites linked to nuclear weapon launch capabilities. However, technological solutions to the issue of falling rocket debris should be available to alleviate the danger. China recently stated that it is developing reusable rockets, with the Long March 8 to feature first stages and boosters that can be landed, recovered and reused following powered descent or parachute landing. Grid fins and other innovations will also be tried out with Long March 6 and Long March 4B rockets, before attempting vertical takeoff, vertical landing (VTVL) as demonstrated by SpaceX's Falcon 9 and Falcon Heavy orbital launch vehicles. However, Chinese attempts at landing rocket stages are not expected until 2020 at the earliest, and will take time to master and replace existing launch vehicles. China will also attempt its first sea launch in the second half of this year, as well as other methods to control landings and mitigate its rocket debris problem, but the issue of raining space debris will persist for some time.